I had a GREAT time at beyond tellerrand, such an amazing and diverse speaker line-up and awesome atmosphere! A week ago from writing these lines, the lunch break of the very first beyond tellerrand in Munich was done already and we had three more talks to go, before everything was over again. Now, on 24th of January, I look back at the event in Munich and am asking myself, whether this was real or just a dream. I mean, all the things that happened before this event actually took place. Not only is it always difficult to start a new show in a new city, as you don’t know the city, the infrastructure, the venue, where to get your a/v tech from and so on, but I also had about 70 tickets left one week before the event. Yes, the days would have been nice as well, with not being sold out, but if you have a full house it is nicer for everybody, like the speakers, when they look down from the stage into the audience, but also for the attendees themselves. More people mean more potentially conversations and new friends. In addition to this, the death of my mother did not help in the weeks leading up to the first Munich edition. The timing wasn’t chosen too well and super close to the Berlin edition before and too close to the beginning of the year, as people were way too lazy to get their tickets from mid December until the week before the event. The cost for venue and a/v was more than double of what I usually pay in Düsseldorf or Berlin in total. It is not just the rent for the venue, but many things add up during the organisation. The hotel, even though it was the cheapest one I could find close to the venue and their service and rooms were really good, was also a lot more expensive and had less rooms than I usually take. The partners were about 50% less than for other events and in adittion a lot of those on board did not want to do anything in the exhibition. Other exhibitors, like t-shirt shops, artists etc, which I love to get for the exhibition, weren’t really keen on doing anything so early in the year and in Munich. I could continue with more details, but don’t want to bother you with this for longer (happy to chat about this, if it interests you, though). In short, next to organisers pain with a new city and difficulties with the circumstances of the venue and Munich, the cost in Munich simply is pretty damn high and comparing to Düsseldorf or Berlin, I would have to actually rise the ticket price, if I want to do it in the same venue, with the same circumstances. But I said , if you would have asked me before this event, which means, if you ask me now, I am not too sure if I won’t do it again. So many of you have asked to come back and I am sure, there must be venues not too far out of Munich, where a coffee for the attendees won’t be close €3 a cup – and of course I’d never thought of rising the ticket prices. Actually, I am already looking into possible venues. I have to do the final maths, though, and will check venues. If there is anything that fits my idea, the atmosphere and also my budget, why not give it another try, as I really enjoyed my time and the people being in Munich. But now let’s get to the content for Munich 2018. All the videos had been online during the event already, a few blog post are already published and also photos are online from a few people already. As usual, I will keep this post up to date as long as I get material and coverage. As said earlier, the atmosphere in Munich was great. People enjoyed the talks, had good conversations in the breaks and I have been happy to see this. Let’s see how Munich turned out in terms of numbers. In this section I usually give a bit of an insight few about what all people in the venue drank, where people travelled from and so forth. So let’s have a look at a few numbers. For a long time already, I am using Remy Sharp’s Confwall for the big screen during the breaks. Next to visualising announcements and information for the attendees, it also shows the tweets related to the event. I can totally recommend having a look at it, if you are running events yourself. 1872 tweets have been archived by Confwall during the days, mentioning the event. The lovely team of Munich 2018 – my wife was already on her flight back. Photo by Martin Kraft. 14 volunteers did an absolute wonderful job once more. They arrived from 4 different countries to set up the event on Monday together with me and keep my back free during the event, taking care of anything that had to do with registration, running the exhibition, taking care of the attendees and partners. Thanks a lot to: Alex, Amr, Andy, Arne, Gustav, Jana, Jonathan, Lisa, Patrick, Philip, Susanne, and Tom. My wife Tanja and Guido are coordinating the team during these days. You won’t believe how great it is to have such a great team at any of the events. During the break – many good and interesting conversations. Photo by Martin Kraft. Delegates came from 18 different countries to attend the first beyond tellerrand in Munich. People came from Australia, Austria, Belgium, Bulgaria, Czech Republic, Denmark, Egypt, Finland, Germany, Italy, Netherlands, Poland, Romania, Switzerland, Syria, Turkey, United Kingdom and United States. As soon as I got the evaluation about what we drank, I will also list these numbers here. The Warm-Up was hosted and organised by the lovely people from Microsoft. They offered their Atrium for our pre-conference gathering and provided food and drinks. Huge thanks once more for this! Especially to Jan Schenk and Kyle Pflug. Wonderful to have support of people like them. During the event we had two Lunch-Time Sessions again. Keir Whitaker and Kim Fleming of Shopify hosted one on the first day, where Gavin Ballard, who came straight from Australia, gave a presentation. On the second day Melanie Richards of Microsoft hosted the Lunch-Time Session and gave a talk on CSS Grid. Right after the event was done, a couple of meetups took place in Munich, which teamed up as well and even invited speakers to give a talk. The Data Visualization Meetup Munich invited Nadieh Bremer to speak on the evening of Wednesday. The Drupal User Group Munich also held their meeting on Wednesday evening. And on Thursday 18th the MODX Munich Meetup opened their doors. Thanks to all of the groups who teamed up! Session break in the exhibition. Photo by Martin Kraft. Photos are always important to me, as they bring back memories. I myself am taking a lot of photos at events, when I attend. I try to capture the moments, when people interact, when they laugh and have fun, when they exchange. Of course, there will always be shots of the speaker on stage as well, but for me it is not important to hit the most perfect shot, but to freeze a good moment onto a photo. Andreas Dantz has taken another great set of photos. He, I think, took photos of nearly every beyond tellerrand so far. Thanks Andreas for your photos! Christian Heilmann not only was one of the speakers, but he also took quite a lot of photos, which I did not take notice of, when we were in Munich. What I like at this set is, that they show a lot of behind the scenes shots, where you can see, what we do before an event like this. Thanks Chris! The next set of photos was taken by Martin Kraft, who also took photos at a lot of my events already. So far he uploaded his shots from the Warm-Up, but promised that the rest will be up soon as well (actually they should after the last weekend … hehehe). Thanks for your lovely shots! With Stefan Nitzsche we have another known person, taking photos at beyond tellerrand for quite a while. Find his set of photos on Flickr as well. Cheers for taking them. I don’t get tired of stating how much event organisers like me need you to spread the word. Not only are blog posts by attendees, partners and speakers just great, as they bring back memories, but they are also important for any event, as they are the base on which some new attendees might decide to come to an event. Here are the first blog posts I found. Anything I get later will be added. Isabel Schrage wrote her summary about her first beyond tellerrand ever. She came to Munich with her colleagues Tom, Fabian and Daniel and everybody mentions their favourite talks of Munich next to a long and complete write-up by Isabel. Happy that you liked it and thanks for the blog post! Christian Huber was in Munich, which was his second beyond tellerrand after 2016 in Düsseldorf. He has written a detailed summary about it, which you are able to read here. Thanks Christian. Chris Heilmann has spoken at a couple of my events, even when I still ran the Flashforum Konferenz. I was delighted that my long-time friend opened the very first Munich edition with his talk and am even more happy, that he took photos and has written a blog post about the event, providing his slides of the talk, but also summarising his experience of beyond tellerrand in Munich. Thanks a lot Chris! A short article at our friends from Design made in Germany about the fantastic opening titles by Sebastian Lange. Another interesting read is what Justin Avery has written. It is not really a wrap-up or review of the event, but he, as one of the Partners, produced lovely notebooks for the attendees and gives you insights into the process of designing and creating them as well as the final production. Great post, Justin – thanks. I accidentally stumbled over this nice recap by Daniel Potthast and René Georgi. Thanks for writing and I am glad you enjoyed the days. I said it before, but also here: anything I get from now on will be added. In the following block of text, I am listing all links to videos on Vimeo and YouTube, but also the link to the speaker profiles, which contain slides (if given) and a text version – transcription – of the talk as well. All talks were online on Vimeo on the day when they were given. Check back for updates of content related to the talks. Robin Christopherson with From AI to robots, from apps to wearables – let’s design for everyone, OK? All missing transcriptions will be added piece by piece. The missing videos are not allowed to be published yet. As soon as they are, I will publish them. Stefan gave me the ok to publish his last talk from Berlin 2014 about Happiness, though. Alex, a volunteer from Berlin last year, was also part of this year’s Munich edition. He published two nice videos from a day before the event as well as from the show itself on his YouTube channel. Thanks Alex! Joschi, as mentioned earlier, also published the two videos of Marcy and Robin speaking at the a11y Club in Munich. I can’t describe, how nice it is to get things for your event, to see bits and pieces coming together. I was happy, when bkopf from Berlin said yes to design the t-shirt for Munich and think it turned out very well. It, once more, is completely different to any of the other t-shirts, but that is what I like. 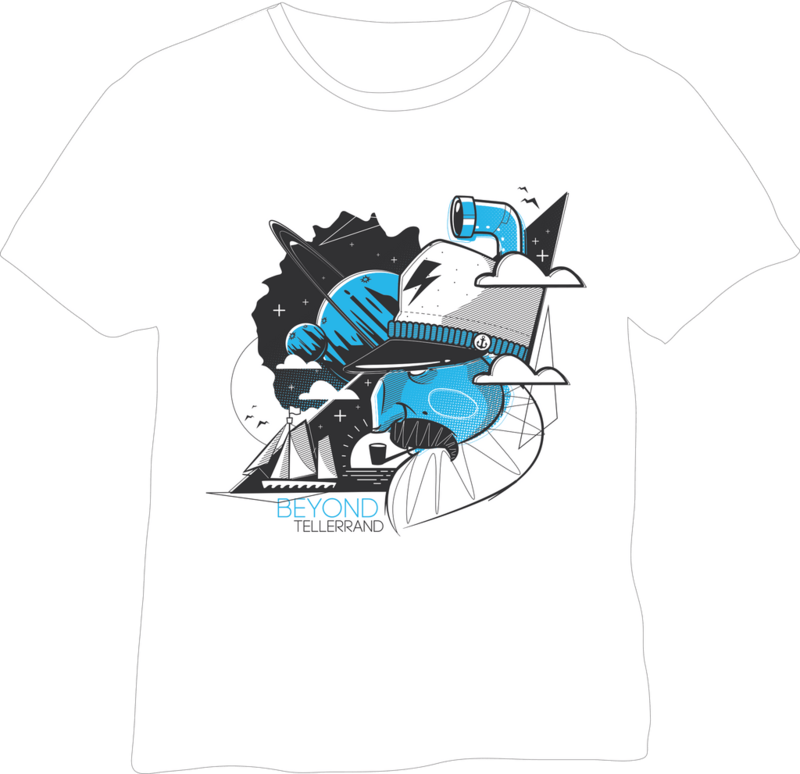 With this way of designing the shirts and the event, the attendees never know what to get and expect until they attend and it does not get boring for them, if they return. Thanks bkopf for your great work! My long-time partner in crime, Sebastian Lange, once more worked on the Opening Titles for Munich. Another time that I bow and say: Well done and thanks so much, Sebastian! That’s it for Munich so far. All updates will be listed below with the time I added things, so that you know if new things were added to the long text above. Easy, right? In the beginning I have written that it was 24 Januar, when I started this post. Now it is 2 Februar, when finishing the first version of this post. I this past week, so man things happened, like the funeral of my mother, and I did not know about all the things to be done after someone dies. This kept and keeps me busy and I am by far not as far with the wrap-up for Munich as I wish to be. Be sure you will get a newsletter soon and watch your inbox. Thanks for a lovely time in Munich once more and see you soon (hopefully). My next stop on the beyond tellerrand journey is DÜSSELDORF, where we stop for the eighth time already. Will you be there? So much work these days. So hard to get my head around all these things at the moment. Thanks for your support and all the lovely things you say. If you still wonder about @btconf, just witness how meticulous @marcthiele is in his event coverage: beyondtellerrand.com/blog/wrap-up-m… All the videos, in-depth notes, slides and photos. Just a reminder: all the coverage and material from #btconf January in Munich can be found here. beyondtellerrand.com/blog/wrap-up-m… Did I miss any blog post or photos? Let me know.